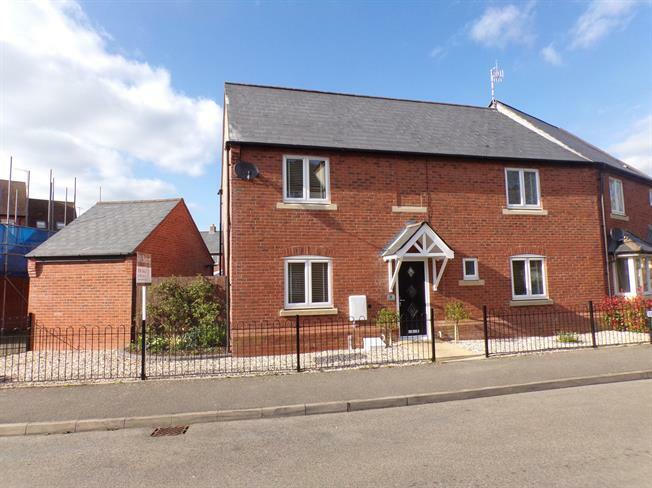 3 Bedroom Semi Detached House For Sale in Stratford-upon-Avon for Guide Price £275,000. A much improved three bedroom modern semi-detached family home with garage and parking. Positioned on the ever popular development know as Trinity Mead south of The River Avon. The current owners have very cleverly removed the wall between the dining room and kitchen to create a dual aspect open plan beautiful breakfast kitchen with access to the garden. The accommodation is well presented throughout allowing, entrance hall, cloakroom, sitting room, three generous bedrooms, the master bedroom having an en-suite and a bathroom. Outside is a landscaped well kept rear garden, parking and a garage. We advise viewing to appreciate this fab home! Laminate to the floor. Stairs rising to the first floor. Radiator. Double glazed window to the front elevation. French doors opening onto the garden. Two radiators. Coving. A range of matching wall and base units including roll edge work surfaces incorporating a stainless steel sink and drainer unit. Integrated is a four ring gas hob and electric oven with extractor hood overhead. Space for a fridge freezer, washing machine and dishwasher. Tiling to the walls and floor. Double glazed bay window to the front elevation and double glazed window to the rear elevation with doors to the garden. There is a handy storage cupboard off the kitchen ideal as a pantry. White suite allowing a low level w.c and wash hand basin set into a vanity cupboard with tiled splash back. Laminate to the floor. Double glazed obscure window to the side elevation. Radiator. Double glazed window to the rear elevation. Loft access with ladder. White suite recently refitted allowing a low level w.c, wash hand basin set into a vanity unit and corner shower cubicle. Vinyl floor and tiling to the walls. Double glazed obscure window to the rear elevation. Radiator. Double glazed window to the front elevation. Built in wardrobe. Airing cupboard housing the boiler. Radiator. White suite allowing a low level wc, wash hand basin set into a vanity unit and bath with shower over. Oak effect flooring and tiling to the walls. Double glazed obscure window to the rear elevation. Radiator. Laid to lawn with a paved patio area. Enclosed by fencing with planted borders. Between the house and the garage is a handy play area or a storage area with an artificial lawn. Cast iron picket fence with a gravelled garden with an array of planted shrubs.